I always chuckle when I toss this knobby, slightly hairy, root vegetable into my grocery cart. I just love the reaction I get when I place it on the cashier’s belt while waiting in line at the check-out. Celery root, also known as celeriac, is one ugly looking vegetable. But don’t judge it by its cover! It’s flavour is unique – a taste of celery and parsley combined. With the texture of a turnip, celery root can be enjoyed in soups or stews. But, our favourite way of eating this highly nutritious vegetable is raw. Traditionally, our family has eaten celery root grated and tossed with yogurt and sour cream. In a mean craving for the same delicious salad, I decided to replicate an old family recipe by replacing the dairy with my own cashew cream. The result was heavenly! Just like Oma’s! Puree cashews, water and sea salt in a food processor. Add remaining ingredients and process until dressing is smooth. Transfer dressing to a large glass bowl. Celery root must be peeled and rinsed well prior to eating. It also tends to darken quickly once peeled, so its best to toss it with some lemon juice (if you are still preparing your dressing). Once grated, transfer the celery root immediately to your glass bowl and toss it with the dressing to prevent discolouration. Toss salad with walnuts and hemp seeds prior to serving. This entry was posted in Soups and Salads and tagged celeriac, celery root, gluten-free, hemp seeds, nutritious food, salad, vegan, walnuts on January 2, 2013 by uberdish. This recipe comes from one of my favourite vegan cookbooks and resource, “Whole Foods to Thrive: Nutrient-Dense, Plant-Based Recipes for Peak Health” by Brendan Brazier. Brendan, a plant-based nutrition expert, is the formulator of Vega products and a professional triathlete. I have met him twice and each time I am clearly “star struck”. Turmeric, ginger, coriander and cumin spices give this dish a very distinct flavour. These “wonder” spices are high in antioxidants, ease digestion and help tame inflammation – beneficial for those suffering from arthritis, Chron’s, IBS and other inflammatory conditions. I love the amount of protein in these guys. 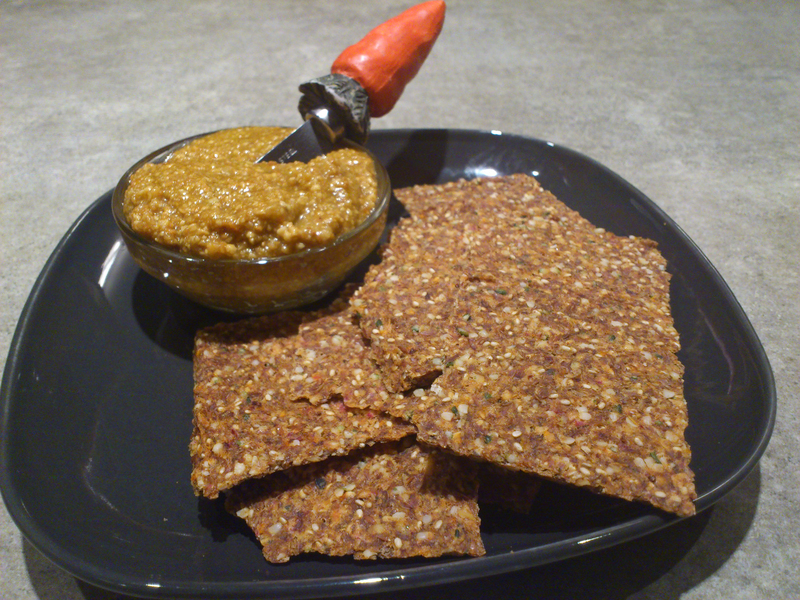 This recipe contains 1 ¼ cups cooked red lentils which is over 18 grams of protein. Also, the hemp seeds in this recipe, albeit only 3 tablespoons, add roughly an additional 20 grams! If you ate all of these patties at once, and believe me you’ll be tempted to do so, you would be getting a good portion of your daily protein requirement. These patties are a wonderful make ahead meal and they are super easy to prepare. If I do have extra time, I like to make smaller patties and place some in the freezer for those crazy, busy nights. They travel well in small containers and can be eaten as finger food – perfect when eating out for lunch or dinner (at the skating rink on most nights, in our case). Hope you enjoy this uber-nutritious dish! Melt the coconut oil over medium heat and saute the onion, celery, and red pepper until the vegetables are soft. Add the garlic and saute for about 1 more minute. Remove vegetables from the heat and let cool . Scoop mixture into a food processor or large mixing bowl. Add the remaining ingredients to the vegetable mixture. Pulse mixture a few times in a food processor or, if you do not have a food processor, mash some lentils with a fork. 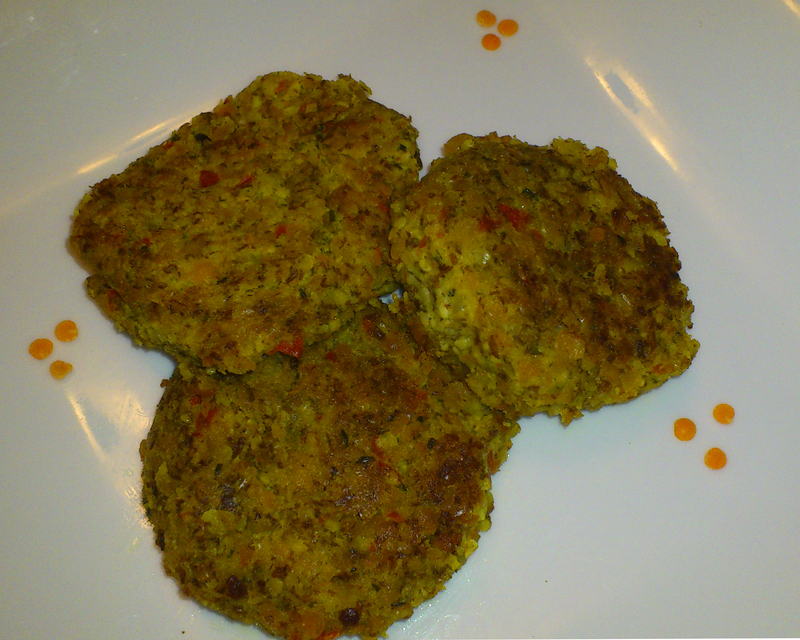 (Lentils that are well mashed make it easier to form patties). Adjust salt as needed. Hand shape mixture into patties of desired size. Heat a small amount of coconut oil in a large frying pan over low heat. Cook patties until brown on both sides. *Coconut oil, made from the fat found in the meat of a coconut, is one of the best oils for frying. Unlike other oils, coconut oil does not lose its antioxidant benefits or nutritional value when heated. I love the flavour that it adds to dishes – a little nutty, a little like coconut. When shopping for coconut oil, choose virgin oil over refined. Virgin oil means that the fat was not extracted using chemicals. *Red peppers, as well as other nightshade vegetables, have been known to aggravate inflammation in the body. It may be wise to eliminate this vegetable from the patties, if one suffers from any inflammatory conditions. I have to share this one! 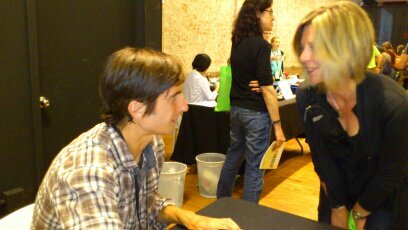 Here I am chatting with Brendan Brazier at “The Seed: A Vegan Experience” in New York City, June 2012. This entry was posted in Side Dishes and tagged brendan brazier, entrees, food, gluten-free, hemp seeds, nutritious food, recipes, red lentils, vegan, vegetarian on October 17, 2012 by uberdish.